November 2018 marks the 100th anniversary of the end of World War I. This column introduces a new VoxEU eBook which takes the opportunity to reflect on recent work that provides a reassessment of the role of economics in the war. The Great War (as World War I was known until 1939)1 formed the 20th century. To mark the centennial of the end of the war in November 1918, it is fitting to review recent work on the economics of the Great War and reassess the state of knowledge. A new Vox eBook includes 20 short essays grouped together into three parts covering the preparations for, conduct of, and consequences of the war. There has always been disagreement over the origins of the Great War, with many authors offering different views of the key factors. One dimension concerns whether the actions of agents should be characterised as rational or irrational. Avner Offer continues to take the popular view that the key decision-makers were irrational in the common meaning of “stupid”, arguing that “(t)he decisions for war were irresponsible, incompetent, and worse”. Roger Ransom, by contrast, uses behavioural economics to introduce bounded rationality for the key decision makers. In his view, over-confidence caused leaders to gamble on war in 1914. At this stage, they expected a large but short war, and when a quick result was not achieved, they then faced the decision of whether or not to continue fighting, or seek a negotiated settlement. Here, Ransom views the decisions of leaders to continue fighting as driven by a concern to avoid being seen to lose the war, consistent with the predictions of prospect theory, where people are more concerned about avoiding losses than making gains. Mark Harrison sees the key decision makers as acting rationally in the sense of standard neoclassical economic thinking, choosing war as the best available option in the circumstances that they faced. For Germany and the other Central Powers in 1914, the decision for war reflected a rational pessimism: locked in a power struggle with the Triple Entente, they had to strike then because their prospects of victory would only get worse. A second dimension concerns the deep causes of the war. Branko Milanovic uses modern economic analysis to provide an empirical assessment of an old Marxist argument that emphasises underlying economic causes of the war. Here, the chain of reasoning runs from high wealth and income inequality to the search for new and more profitable investment opportunities overseas, leading ultimately to imperial conflict. Using data for the key belligerent countries, he suggests that the main links in the chain of reasoning can be empirically supported. First, wealth and income inequality were extremely high before the Great War; second, this was associated with high levels of foreign asset holdings; third, risk adjusted rates of return were higher on overseas assets than on domestic assets; fourth, overseas assets were predominantly held by the very rich; and fifth, countries with a higher share of overseas assets tended to have a higher share of the population engaged in the military. Harrison, by contrast, emphasises underlying political causes. For him the key problem lay in the closed systems of rule in Austria, Germany and Russia, and in the failure of deterrence. As he puts it, “(i)f capital and labour had been represented in the Austrian, German and Russian cabinets, there would have been no war”. For a while, deterrence worked and war was avoided. But the leaders of the Central Powers believed their enemies were growing stronger, and in 1914 despite knowing that they might be defeated, they thought that the prospect of victory would only get worse. In these circumstances, deterrence failed. Jari Eloranta uses the arms race before 1914 to introduces another set of agents, besides the political leaders, who have sometimes been blamed for the war: the arms manufacturers or ‘Merchants of Death’. Whilst international armaments firms are sometimes blamed for selling weapons to both sides, national arms firms can be seen as forming part of a military-industrial complex. This explanation can therefore be seen as encompassing both economic and political underlying causes. Anticipations of war are also captured by Harold James and Timothy Hatton in chapters that approach other aspects of national advantage on the eve of war: finance and male stature. Surprisingly, perhaps, the conduct of the war between 1914 and 1918 has been a relatively neglected topic for economic historians. Most economic histories of the twentieth century tend to focus on the pre-World War I, interwar, and post-World War II periods, leaving out the war periods themselves as aberrations that are not amenable to normal economic analysis. A natural question for economists to ask is whether the outcome of the war was determined by resources. This is something that military historians have been reluctant to concede, preferring to focus on factors such as leadership, discipline, heroism and villainy. As Stephen Broadberry points out, however, the point is not that leadership and psychology did not matter, but rather that they mattered less than in previous conflicts before the era of Total War, when numbers of men and the volume of supplies assumed the decisive role. The tabloid banner headline would be “It’s Economics Wot Won It”. In addition to this overview of why the Allies won, special attention is paid to recent work on the economies of the losers: Germany, Austria-Hungary, and Russia. One traditional view, which is overturned by Tobias Jopp, is the idea that Germany’s business elite conspired with political and military leaders to bring about a global war so that they could earn large profits. This view was based on a perception of rising profitability during the war. In fact, however, Jopp finds that although profits rose in nominal terms, prices rose faster, so that in real terms, profits declined sharply. Turning to Austria-Hungary, Tamás Vonyó examines the popular view that economic fragmentation within the Empire had already taken hold before 1914 and widened during the war so that by 1918 Austria-Hungary had already effectively broken down. He finds that on close examination of the statistical evidence, the Habsburg economy only began to run out of steam after the summer of 1916. A chapter by Herman de Jong and Stefan Nikolić reviews the economics of wartime neutrality. One of the great ironies of World War I was that the economies which found it most difficult to feed their citizens were those that were self-sufficient in food before 1914. By contrast, Britain, which was highly dependent on grain imports and thus seemed the most vulnerable to blockade, managed to increase domestic agricultural output during the war and maintain food imports through the adoption of the convoy system (Broadberry and Harrison 2005). In Russia, which had been a major grain exporter before World War I, it was widely believed that there was massive surplus labour in the countryside, so that 15 million males could be mobilised into the Russian army without seriously disrupting agricultural production. As Andrei Markevich shows, however, this proved to be far from the case, and by 1917 agricultural output had fallen by 20%, with the magnitude of the decline in grain output by locality highly correlated with the incidence of the military draft. In addition, the war damaged the incentives of individual farmers to supply food to the market rather than producing for themselves. The unwillingness of peasants to provide grain to the market created food shortages in the cities, which led ultimately to the overthrow of the monarchy in 1917. The longest section of the eBook is devoted to the consequences of the war, reflecting the importance and persistence of the effects of this watershed event. Many of the most significant consequences were for labour. First, the Great War ended millions of lives through death in battle, while many others who should have survived were killed by an influenza pandemic during 1917-18. Second, a war that moved millions by force also ended free movement across borders as restrictions on migration became normal. Third, a by-product of the war was a sharp reversal of inequality within countries. There were also important consequences for growth and trade; although the peace began with unprecedented efforts for global recovery, growth and trade continued to be disrupted, with further negative shocks in the form of the Great Depression and World War II. Every country tried to ‘learn lessons’, but some lessons were mistaken. Dealing first with the consequences for labour, Robert Millward quantifies the demographic effects of the war, including 10 million deaths in the fighting, 20 to 40 million deaths from the flue pandemic in 1917/18, and up to 2 million deaths in the Armenian holocaust. Peter Gatrell reviews the refugee crisis that arose during the war and continued after it. Drew Keeling shows how the Great War acted as a clear turning point between the era of largely peaceful, voluntary migration in response to market incentives before 1914 and the subsequent era of quotas and legal restrictions or flight from war, oppression or other disaster. Walter Scheidel notes that the Great War ushered in the ‘Great Compression’, or dramatic reduction of inequality in the distribution of income and wealth across developed countries, brought about by dramatic tax increases, aggressive government intervention in the private sector, the loss of capital, and the democratisation and empowerment of organised labour. Figure 1, taken from David Jacks’ chapter in the eBook, shows how the war affected the global economy. The short-run effect was a sharp decline in world exports as war disrupted pre-war trading patterns and submarine warfare hit shipping. A partial rebound occurred in the 1920s, but without surpassing the 1913 peak. The Great Depression was then associated with a further sharp decline from 1929, with the recovery of the 1930s still failing to surpass the 1913 peak. 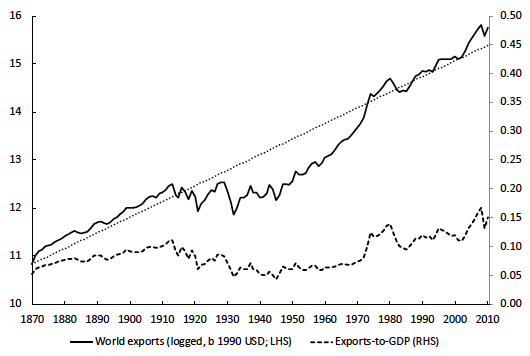 The straight dotted line projects forwards the prevailing linear trend during the period 1870-1913, and shows that world exports only returned to trend during the 1970s, more than half a century after the end of World War I. Source: Broadberry and Harrison (2018), Chapter 20, Figure 3. Hugh Rockoff argues that the Americans learned the wrong lessons from the Great War, partly because of the “halo of victory” that surrounded wartime policies and personalities. A lesson that policymakers might have learned from the early phase of the war is that deficit spending combined with expansionary monetary policy can propel the economy towards full employment. However, economic theory was not yet ready for this macro lesson and policymakers chose instead to learn the micro lesson that government intervention could improve the allocation of resources. This helped to frame some of the evident errors of US economic policy of the interwar period. A further lesson drawn by many Americans was that the war had been brought about not because democracy was in danger, but rather by the ‘merchants of death’ for reasons of greed. This view underpinned isolationism in the 1920s and delayed rearmament in the 1930s despite growing threats from Germany and Japan. Nicholas Crafts considers the lessons learned by the British. Of course, there were large losses arising from the high rate of casualties, the destruction of domestic capital and the liquidation of overseas assets to pay for the war, which limited the options of British policy-makers. However, attention must also be paid to the continuing difficulties arising from changes in the world economic environment. Britain before 1914 had been more dependent than other countries on the liberal global trading environment. In the more protectionist environment of the interwar period, the ratio of trade to GDP fell sharply, and export markets had been lost to import substitution in overseas markets when wartime disruption meant that British firms could no longer supply them. This meant higher unemployment at home and a squeeze on real wages. On top of this, the debt-to-GDP ratio increased from 25% in 1913 to 130% by 1920, creating a need for a primary budget surplus to preserve fiscal sustainability. “Walking wounded” is the phrase that Crafts uses to describe the British economy during the interwar period. Studying the organisation and leadership of international efforts for reconstruction after World War I, Patricia Clavin shows that these were in several ways a dress rehearsal for the more extensive efforts after World War II. Since the first round of our work on the Great War (Broadberry and Harrison 2005) there has been a tremendous broadening of the focus of serious investigation, which now embraces the psychology of decision making, anthropometric history, the natural environment, migration and displacement, the global financial architecture, and inequality of wealth and incomes. There is always something new to discover from the study of war, and discovery is what drives scholarship forward. If humans will ever learn to prevent war, scholarship will have played its role. Broadberry, S and M Harrison (eds) (2005), The Economics of World War I, Cambridge: Cambridge University Press. Broadberry, S and M Harrison (eds) (2018), The Economics of the Great War: A Centennial Perspective, a VoxEU.org book, CEPR Press. “The great war’” was first mentioned in The Times on 5 August 1914 (p. 7), announcing The Times' war maps (source: The Times Digital Archive, accessed 5 November 2018).